Dr. Thomas Broussard, a stroke survivor, author, and educator, gave a presentation to friends and staff of Lingraphica on Wednesday, June 28. 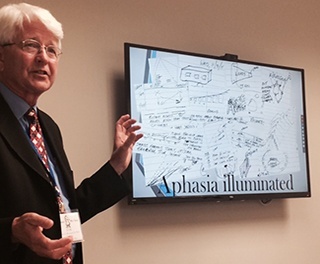 Read on for his stroke and aphasia insights and a video of the presentation. On September 25, 2011, Tom Broussard was an Associate Dean of Admissions and Career Services at the Heller School at Brandeis University. The day after, he had a stroke while walking down a street in Waltham, MA, and his life was changed forever. Tom’s wife was with him at the time of his stroke, and she was able to get him to the hospital in time to receive tPA, the clotting-busting drug that can make a world of difference in terms of damage done to the brain, and thereby, the degree of recovery that is possible. While in Massachusetts General Hospital, Tom began to realize that something was wrong with him, but he wasn’t sure what had happened. He could move and walk and had feeling in his limbs, but he couldn’t speak. He could, however, draw. And so he began to doodle pictures in place of the words he wanted to say but couldn’t find due to the aphasia that set in. Tom continued to draw, and as he began working with an SLP, some of his words came back. But Tom was quick to point out that speech therapy is just the tip of the iceberg when it comes to regaining one’s speaking modality. Tom ventured out into the streets around Boston, armed with very few words to communicate with others and his phone. He began with street signs or other signs that had two or three words. He’d take pictures of them with his phone, show his wife when she returned home from work, and asked her to pronounce the words. Then he would practice. He’d also use his phone to record himself speaking in an effort to improve. After his stroke, Tom lost his job at Brandeis and moved to Florida. As he began to see marked improvement with his aphasia, he decided to help others learn about aphasia and how the brain can heal itself through the principles of plasticity—the brain’s ability to change and form new connections between neurons or brain cells. He’s now a stroke educator and author of two books (Stroke Diary: A Primer for Aphasia Therapy and Stroke Diary: The Secret of Aphasia Recovery (Vol. 2), and he has plans for several more books. His goal is to travel to all 50 states to educate anyone who wants to learn about stroke recovery and aphasia. If you’d like to schedule a presentation with Dr. Broussard for your facility, hospital, or aphasia group, please contact him. Thomas G. Broussard, Jr, Ph.D.